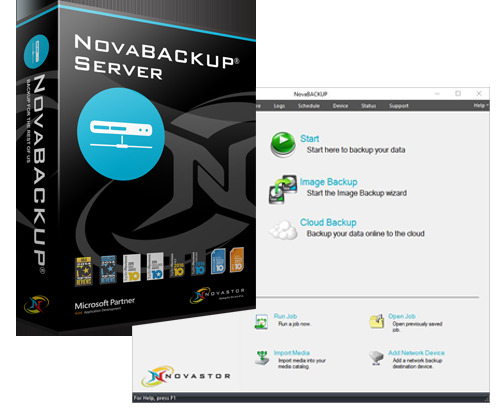 NovaBACKUP automatically backups and protects all the important files stored on your Windows Server system such as mission critical business files, shared images, shared media files, documents and all system information. With easy setup and simple to follow step-by-step wizards, anyone can implement professional and reliable data backup and protection procedures in minutes. Backup your data to hard drives, tape drives, CD/DVD/BluRay drives (with full support for media spanning) plus get online data protection from your choice of world class storage providers ... all in the same, easy to use, software. Receive full peace of mind with automatic (set it and forget it) processes. local and online storage (Best Practices), and full disaster recovery protection to return your system exactly as it was in the event of disaster. NovaStor's patent pending technology, you can find and restore files easily and restore historical versions of files, from a single view, regardless of when or where the files were backed up. You don't even have to remember which device you stored a file on. NovaBackup remembers and tells you! Copy & mirror functionality provides a simple method for twinning/mirroring of data and directories in native format and includes integrated Open File Backup. Fast Bit Technology updates your backups with bit level incremental changes. This makes for super fast backups both locally and online. Other great features include mapped drive recognition, virus scanning, data encryption, and Windows 2008 R2 and 2003 support. NovaBACKUP claims countless technology and consumer awards including TopTenReview Gold, PC World Best Buy , Tucows Five Cows, and more -- plus NovaStor has been protecting millions of PCs for over 10 years and is a proud Microsoft Gold Certified Partner. Try it today. Our download comes as a fully functioning FREE trial. Once you have decided that NovaBackup is right for you, simply purchase a key and activate for all future use.